Hi guys, hope everyone is well. Today I want to talk a little bit about an OBIEE trick (doesn’t looks like but I work with that too :)). Other day I was in a client that was complaining about a performance issue in a Condition validation in a Dashboard. Basically they have a Dashboard with a prompt and a condition to select the Analysis that they want to show in the dashboard. 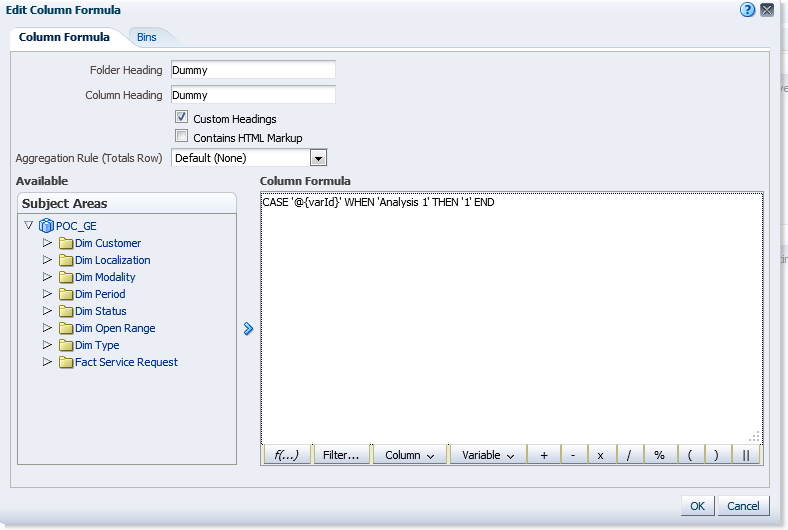 In this dummy column they created a “CASE” formula getting the return of the presentation variable of the prompt and transforming it in a 0 or 1 (false or true). 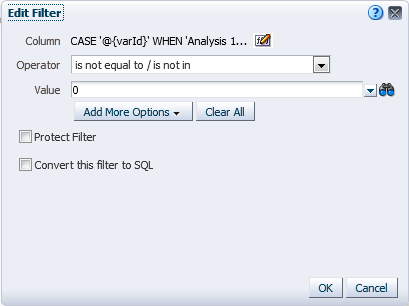 The trick here is simple, when the “Analysis 1” is selected it will return “Analysis 1” in the “varId” presentation variable. 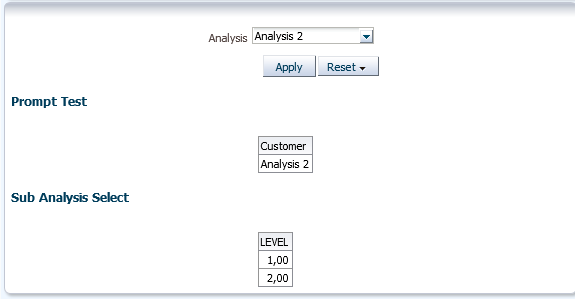 The Case in the analysis will transform this value in 0 or 1 and it will make one Analysis return rows and the other returns none. The “Condition” in the dashboard will count the amount of rows of each report and will show the report that have more than ZERO rows. And here’s where my trick is handy. What is the problem with this approach? 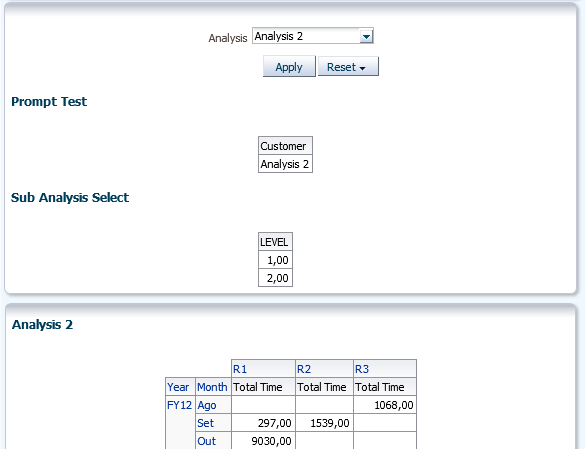 Obiee must count all the rows that return in all analysis before show it in the screen. 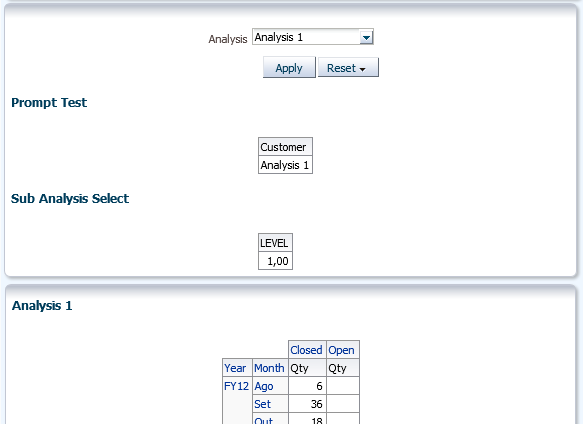 In my client case, they have 6 huge Analysis in this prompt and the time to count the rows in any of the six analysis was bigger than show in the screen the report itself (Remember, Obiee default limit is 25 rows but when you count something it’ll count all the rows that returns not only the 25). 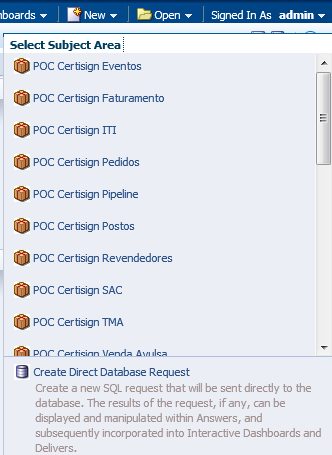 (Also I do not know about other clients but all my clients loves to have huge list reports that the ERP does not provides in OBIEE, and it’s not only Brazilian clients, US clients too). Anyway, this process took a lot longer than I like it, then I created a simple and powerful work around to this. Now we will create a new analysis. This analysis will be create using a “Direct database Request”. In this example, I put 4 in the “LEVEL” and it returns 4 rows, if I put 6 there it’ll return 6 rows and so one. This is an awesome way to generate data without a PL. The final touch. We need only to change our condition and make use of our sub query. 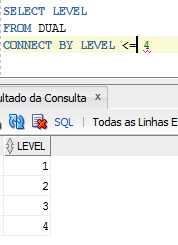 Because OBIEE condition only counts the amount of rows from an analysis I had to create this “CONNECT BY LEVEL” clause. It was the only one to control the amount of rows depending of the prompt. 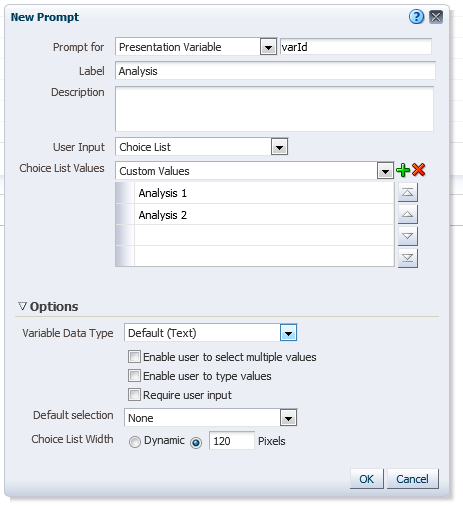 This is a very simple but powerful, reliable and faster way to implement an Analysis prompt in OBIEE, and the best part is that if you do not have it yet you can create it without the need of change your current analysis. Hope you guys enjoy this. See you soon. Now this single OS command will connect to a server, login and execute the set message and display commands. Very simple, but very powerful! Here we are calling a login on essmsh and we are “echoing” some MaxL commands against an Essbase application/database using the –i parameter. The output of this command will be redirected to the -OUT_FILE where you may check it or use it in another process. 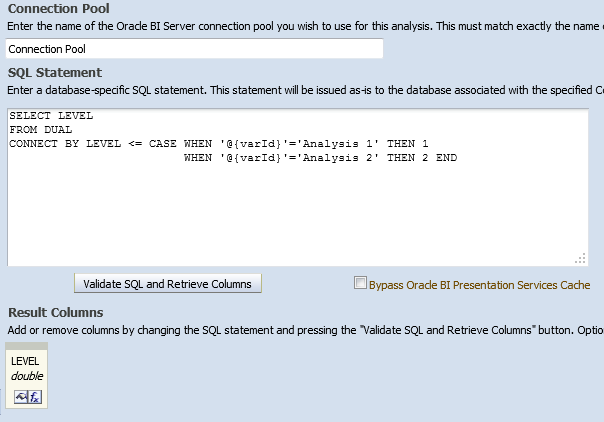 Very handy and easy for a lot of Essbase automation with ODI. Hope you liked this quick tip! See ya!